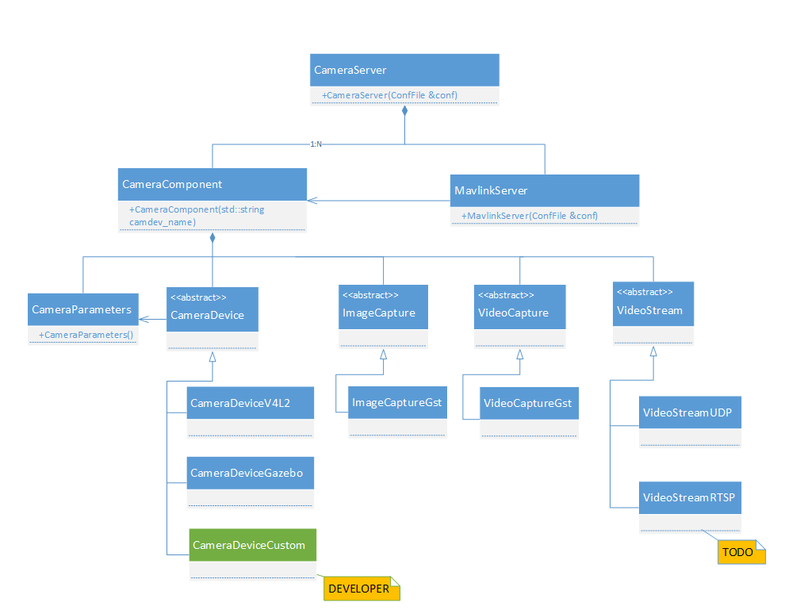 This topic provides an overview of the Dronecode Camera Manager (DCM) architecture, using a class diagram and a description of the main classes. Developers who want to support new types of cameras or custom video streams should see Extending DCM. The CameraServer class detects camera devices attached to the host computer and creates (and configures) a CameraComponent for each of them. The configuration settings are read from the DCM Configuration File. The CameraComponent class creates and manages all the objects associated with a particular connected camera. This includes CameraDevice objects, which are used to connect to the hardware, and other objects that provide camera services. Camera devices that support the gstreamer source element. The gst source element for these types of camera devices can be plugged into any gstreamer pipeline to implement the features like image capture, video streaming etc. Camera device that do not support the gstreamer source element. A Gstreamer pipeline with appsrc element is created for such devices. Concrete classes for this type of device must implement the read() function to return camera frame buffers. The appsrc element is fed with frames returned by read() function. CameraParameters is used to store and retrieve parameters and their values. Each parameter is identified by a name (string), ID (int) and type (enum). The parameter name, ID, type and its value (converted to a string) are stored in a map data structure in the CameraParameters class. Many commonly used camera parameters are already defined in CameraParameters. Developers can either use the predefined parameters or declare new custom parameters (in their subclass of CameraDevice). ImageCapture is the abstract base class for the image capture implementation. VideoCapture is the abstract base class for the video capture implementation. VideoStream is the abstract base class for the Video Streaming implementation.